Just about a year ago, when our cookbook was hot off the presses and I was in search of the perfect wooden spoon to pair with it, my brother (who loves to tackle a good project with me!) did a little “googling” and found Paulie, the Bowl Man, from New Hampshire Bowl and Board. And what a great find he turned out to be! We sold dozens upon dozens of his beautiful wooden spoons in our 2017 Winter Bundle (yes, we still have a few, if you missed out!) Turning to my wood crafting friend again this winter, we were inspired to create a yummy harvest salad worthy of his gorgeous cherry bowl. A little back story…A few years ago, as I was looking for a way to brighten up my roasted butternut squash for Thanksgiving, my dear friend Marlene won me over with her warm butternut squash side dish tossed with spinach, red onions and cranberries. It was as beautiful as it was delicious! So, with bowl in hand, and Marlene’s side dish on my mind, I set out to remake it into a memorable spinach salad. I knew it could be done, I mean, who doesn’t love spinach salad with lots of yummy decorations on top?!? After a fun brainstorming session with her, and a long distance drive into Boston which allowed just enough time to let my imagination run free, I could literally taste it! And I couldn’t wait to get home to my cozy kitchen and actually make it. Here’s to another winter together, Paulie! BAKING THE SQUASH. Place butternut squash on a baking sheet, drizzle with oil and sprinkle with salt. Bake in 375°F oven for 30-40 minutes, until tender, turning once halfway through. Set aside. MAKING THE BACON. Lightly coat both sides of bacon with brown sugar and sprinkle with pepper; lay slices on a baking rack atop a baking sheet and bake in 375°F oven until bacon is cooked (careful not to burn the sugar.) Cool. Chop. Set aside. FOR THE VINAIGRETTE. Combine all ingredients and whir up in a blender. Or, do as Paulie, the Bowl Man suggests, and grab your wooden bowl and a fork and go to town! You can make this a day or two ahead. Refrigerate until ready to use. ASSEMBLING THE SALAD (just before serving) In a large mixing bowl, toss spinach with some of the dressing (though it is very tasty, less is more!). Put remaining dressing in a gravy boat or small pitcher, and let people drizzle on a bit more should they want it. Garnish with all of the toppings and serve. Nothing says summer to me like fresh peaches! We used to spend summers with the family in South Carolina and my grandmother would make homemade peach ice cream and peach cobbler; we would grill some, freeze some, and enjoy some fresh! My grandparents still bring an entire bushel of peaches to my parents’ in VA every summer. 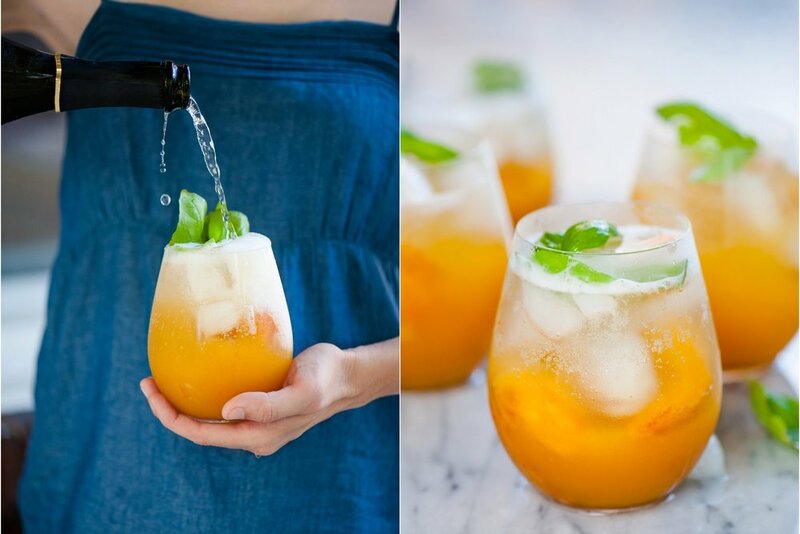 Last summer we had to freeze some of the peaches and I’ve been saving them to make this peach and basil sangria - cold, refreshing, and tastes like the season! In a saucepan, bring the peach nectar, cane sugar, and lime juice to a boil. Simmer for two minutes and remove from heat. Add muddled basil leaves and allow the mixture to come to room temperature. Store in a jar in the fridge for at least 12 hours. The longer the mixture sits, the more basil flavor the drink will take on! Once ready to serve, fill 6-8 glasses with ice and fresh peach slices. Fill glasses with half sangria mixture and half wine. Garnish with a lime sliced or wedged or fresh piece of basil. Enjoy! I love the all-in-one-bowl kinds of meals. It feels like a cozy winter night on the couch, snuggled under a blanket after the baby goes to sleep. I have always been a morning person, but with a warm bowl in my hands and a book in my lap, the evening is just as enjoyable! My husband and I enjoyed this warm and roasted salad bowl on a night just like that. I had prepped the vegetables and made the salad dressing during Sonia's afternoon nap, so come dinnertime, everything was done but the roasting! I put the vegetables in the oven, said our nighttime prayers together, and as soon as the baby was asleep, the vegetables were ready to be tossed with lettuce, vinaigrette, and toppings! Yum! For the Quinoa. Put one cup of quinoa in a mesh strainer and rinse under cold water for one minute. Combine the quinoa and two cups of water in a pot. Bring to a boil. Once boiling, turn the heat to the lowest setting, cover, and cook for 15 minutes. Remove the pot from the burner and let stand for 5 more minutes before uncovering. Store in an airtight container in the fridge until ready to use. This can be added to the salad warm or cold! For the Vinaigrette. In a food processor, combine the oil, vinegar, mustard, honey, shallot, garlic, salt, and pepper, and blend together. Store in jar in the fridge until ready to use. Assemble the Salad. 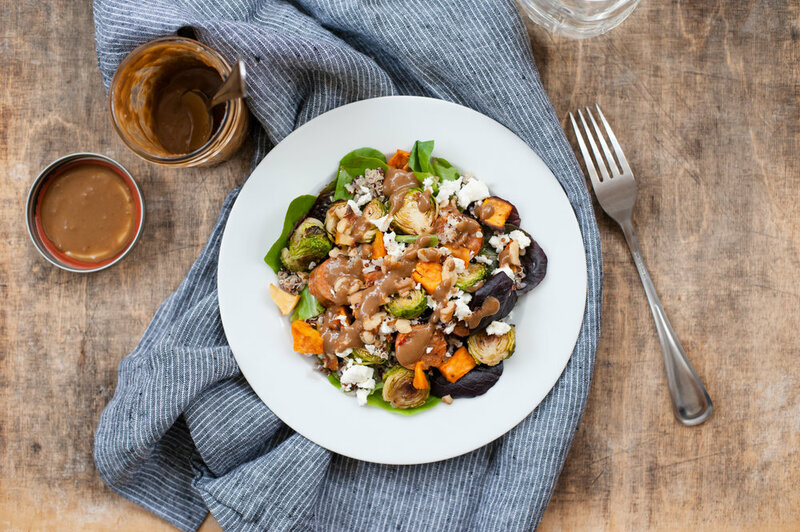 In a large bowl, toss the baby spring mix, roasted vegetables, quinoa, and vinaigrette. Crumble feta cheese over the salad and top with the chopped walnuts. Note: For juicier, more authentic-tasting feta, buy the feta cheese block in the brine. Feta cheese that comes in crumbles is drier with a much more mild flavor. Sweet and gooey Medjool dates are unbelievably versatile and find themselves in a number of my recipes (for appetizers and desserts!) They can add an unexpected note of sweetness to an otherwise savory bite, or be the sweet surprise inside a crispy bacon-wrapped bundle. But sometimes, you just can't beat simple elegance. This no bake no fuss recipe celebrates dates as the perfect vehicle for your favorite filling. Stuff them with goat cheese, top with a walnut half, and add them to your next cheese board. Or, fill them with peanut butter and drizzle with dark chocolate for an easy but elegant dessert. First Things First. Pit each date by making a lengthwise slit down the center of the date; remove the pit. This will leave an opening perfect for stuffing. Filling the Dates. Using a butter knife, scoop up a heaping teaspoon of filling and smooth it into the date. The Toppers. For goat cheese stuffed dates, top each with a walnut half. For peanut butter stuffed dates, drizzle with melted chocolate. NOTE: In a microwave-safe bowl, melt chocolate, stirring every 30 seconds, for 90 seconds or until melted. Use a fork to drizzle. Finish with a ground pistachios or a sprinkle of sea salt. My husband and I have also been enjoying a new-ish scone recipe this week! My Koumbara (a Greek term that we use to reference a godparent—Sonia’s godmother in this instance) and I stopped into Dean & Deluca a couple of weeks ago and had the most delicious eggnog scone, which inspired me to do a Google search for a recipe when I got home. I made my first batch of these scones on Christmas Eve using vanilla extract, and they tasted more cinnamon than eggnog. I made them a second time this morning to use up our extra eggnog, and used eggnog flavoring instead of vanilla extract, which made all the difference! For eggnog lovers, this is a recipe worth sharing that makes your home smell like Christmas! Wishing everyone a Happy New Year and Joyful Feasting always! Using an electric mixer, combine the flour, sugar, salt, baking powder, and nutmeg. Add in the cubed butter and mix until crumbly, followed by the cinnamon chips. In a separate bowl, whisk together the egg, vanilla or eggnog flavor, and eggnog. Pour the liquid ingredients into the dry ingredients and stir using a wooden spoon or spatula until just combined. Transfer the dough to a lightly floured work surface (I used a silicone baking sheet) and split the dough into two parts. With each half of the dough, shape into a circle and cut into six triangles. Pull the six triangles apart and spread on a lightly greased baking sheet. Brush each scone with some eggnog, sprinkle with cinnamon sugar, and place the pan of scones in the freezer for 30 minutes, uncovered. After 30 minutes in the freezer, bake the scones in the oven for 20 minutes, or until they are golden brown. Serve the scones warm, or wrap each scone in plastic wrap and enjoy them throughout the week.